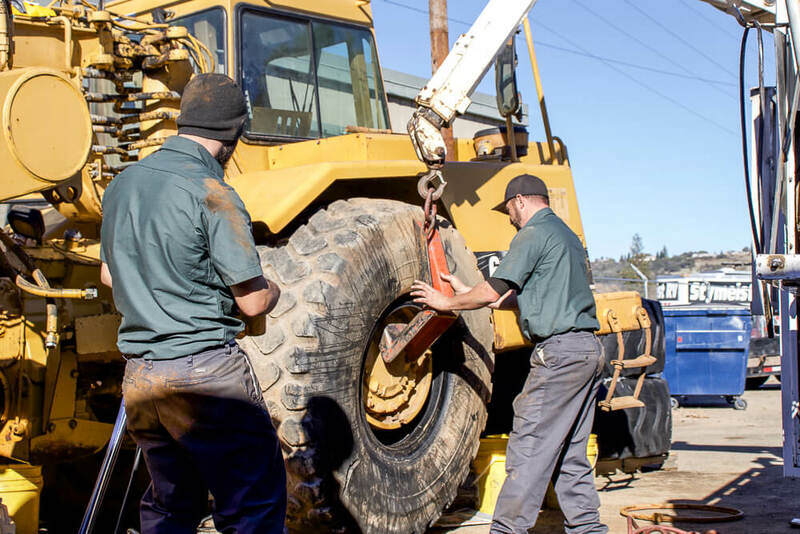 Located in Placerville, CA MonsterTires.com is your go-to resource for industrial tires and tracks. 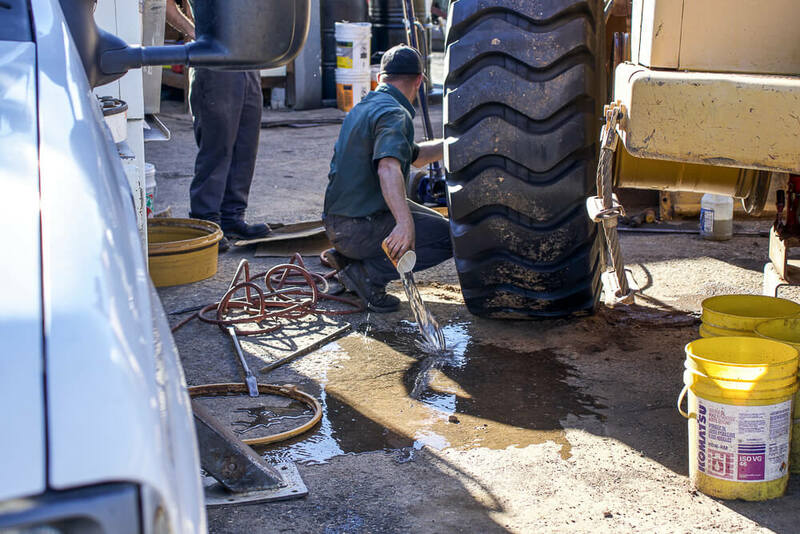 If you are looking for agricultural tires, construction equipment tires, industrial tracks or mining tires, give us a call. At Monstertires.com we carry all the top brands, Mclaren, Maxam, Duramax, Goodyear, Galaxy and many more..whatever it takes to keep your machine rolling! 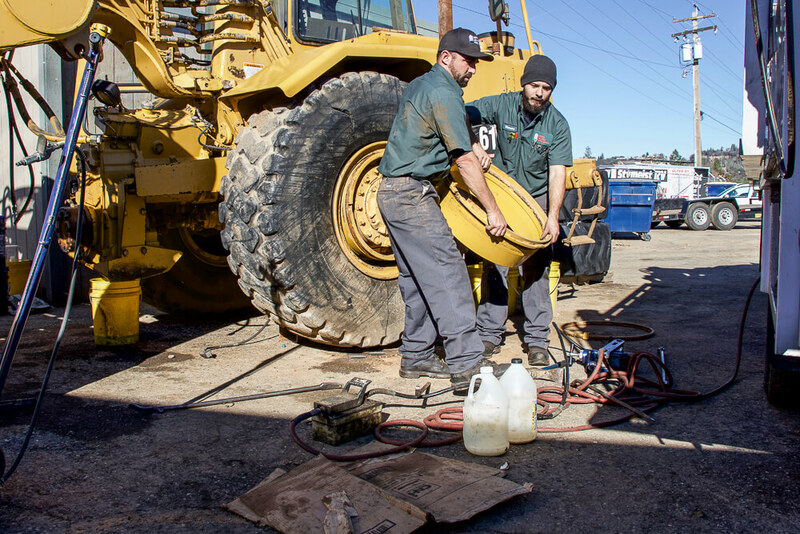 We service greater Northern California including West Sacramento trucking yards all the way up to Redding, Grass Valley, Truckee, Reno, and all the way back down to the Bay Area including San Francisco, San Jose, and Oakland, CA. 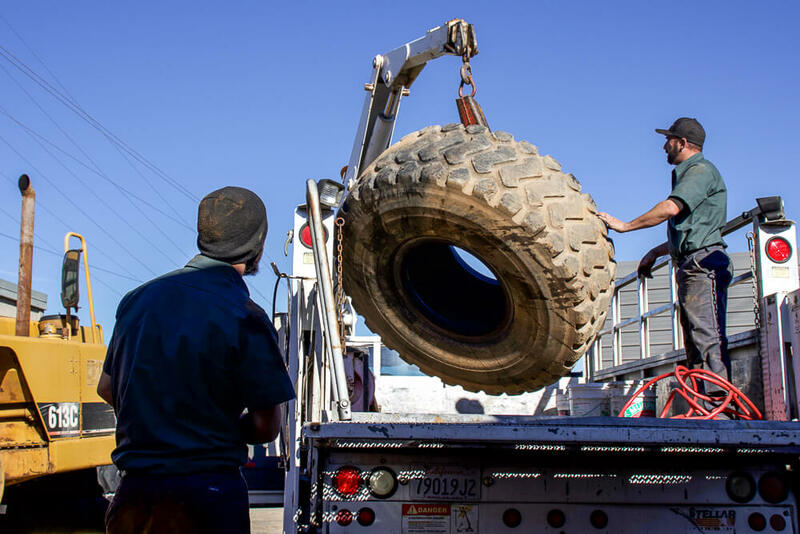 Throughout Northern California, we provide tire install, removal, and repair services to better serve your needs. If you are located outside the Northern California area, we ship internationally. 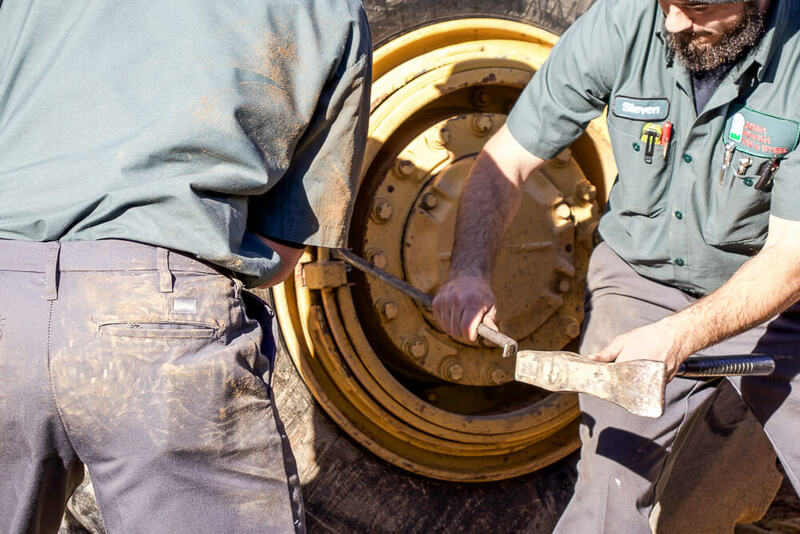 Whatever tires or tracks you are looking for, we can help. 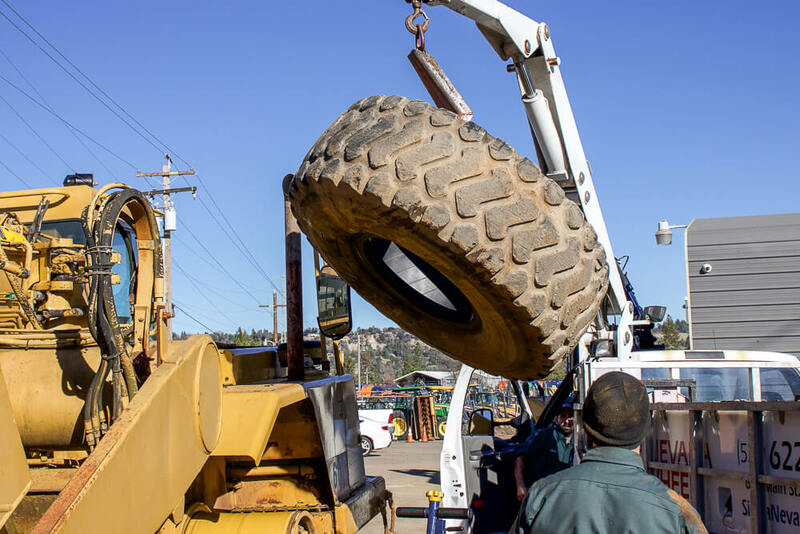 Today, we are going to give you an overview of a common tire installation at our yard in Placerville, CA. Approaching a Caterpillar Motor Scraper and mentally becoming cognizant of the job you are about to embark upon can be a daunting prospect, to say the least. Firstly, there’s the machine itself, which is a beast. The average motor scraper has a total operational weight of around 102,500 pounds. They’re typically around 47 feet in length, 13 feet in width and tower at 14 feet in height. 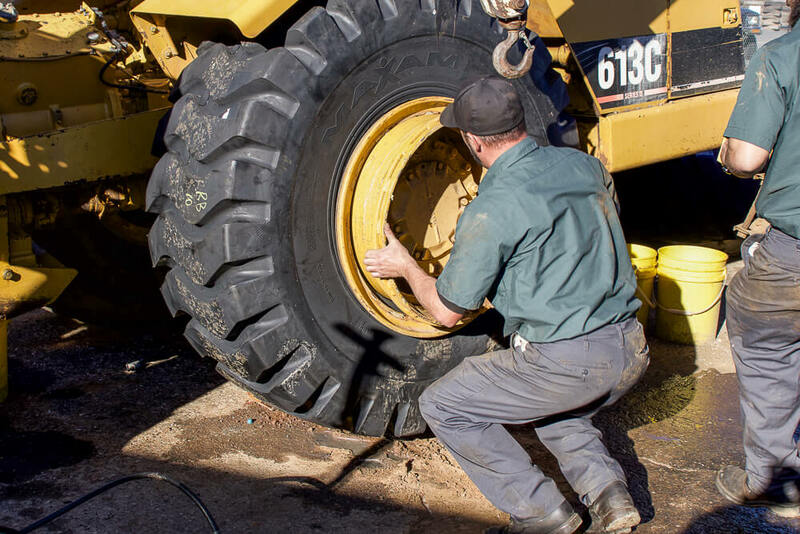 As you visually take in the entirety of this monstrous machine, your eyes land upon the purpose of why you’re there, the job itself, replacing the tire. As you can see from the picture above and have likely seen in real life, these aren’t your average sets of tires. The men in the picture above are close to 6 feet tall and 200 pounds for size comparison. These tires are absolutely massive! The size of the tire being used in this tire install demonstration is 23.5R25. 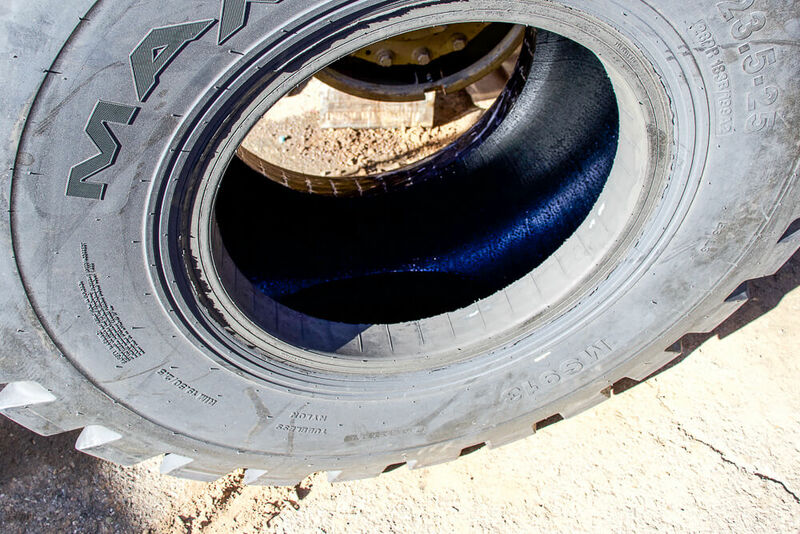 These tires have an overall diameter of 63.5 inches, an overall width of 23.6 inches and weigh an astounding 795 pounds each. I know what you’re probably thinking, this is not going to be fun. But you’re in luck! In this article, I will provide you with all the tools needed to get the job done safely and efficiently and a detailed step-by-step process to ensure your success. 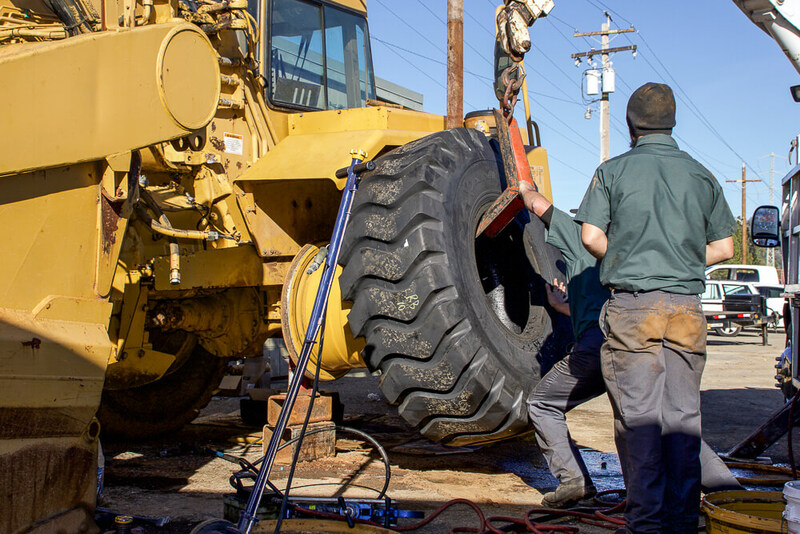 Elevating your unit off the ground is the first step, as with any tire replacement on any type of vehicle. 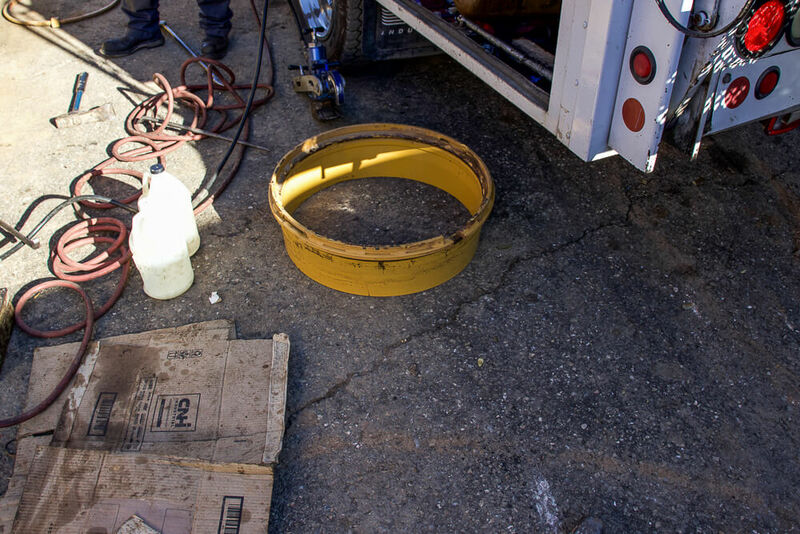 This sets the whole process in motion to begin the removal of the tire and is a required step. 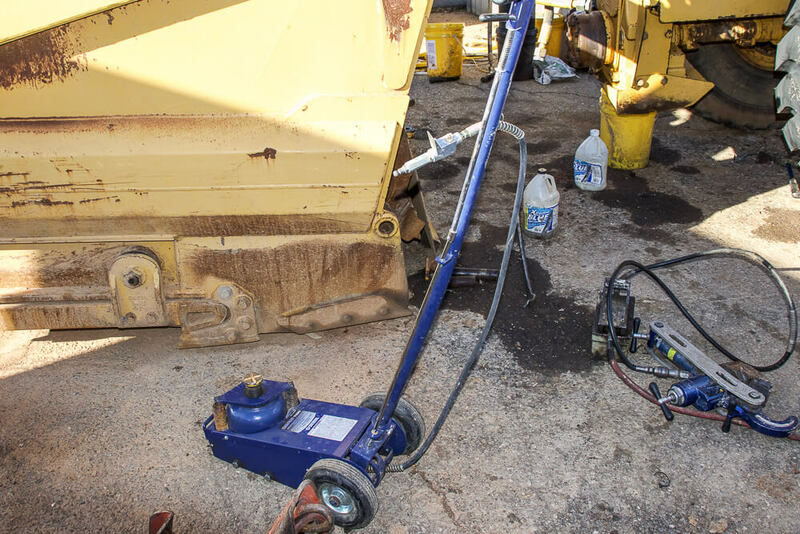 Be sure to get an air jack capable of lifting a motor scraper. The core of the tire is a valve metal piece that is used in virtually all automobile tires. It consists of a valve stem into which a valve core is threaded and assisted by a spring that’s bolted to the rim. If this step isn’t taken before trying to remove outer rings, a blow out could occur. If anyone happened to be on the receiving end of that, things could get ugly. So just to elucidate the importance of this step, once you’ve hoisted your unit off the ground with your air jack, get right to work removing the core, THIS STEP CANNOT BE NEGLECTED. 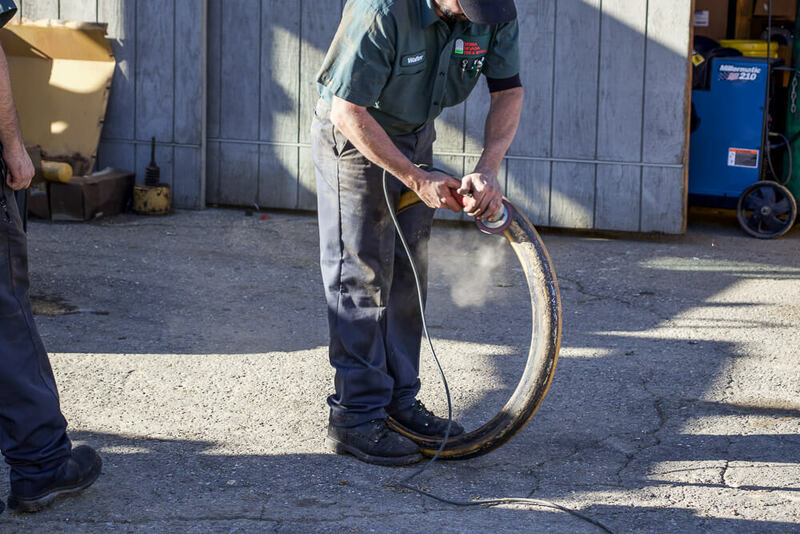 This is a crucial step because it is necessary to remove the keeper ring and inner rings of the tire. As you can see, a porta-power is a required tool to get this portion of the job done. 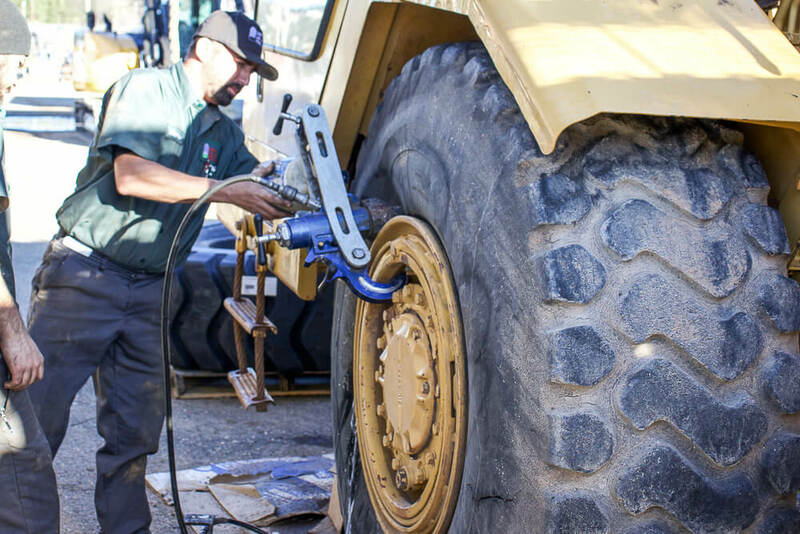 Without having the porta-power its unlikely you would be able to push the bead back far enough to separate the rim from the tire. Skidder bars will come in handy for this step. Once the O-ring is removed you can remove the outer ring. Final Step before being able to take the tire off of the rim. These things aren’t light, having a helping hand nearby will save your pack, literally. 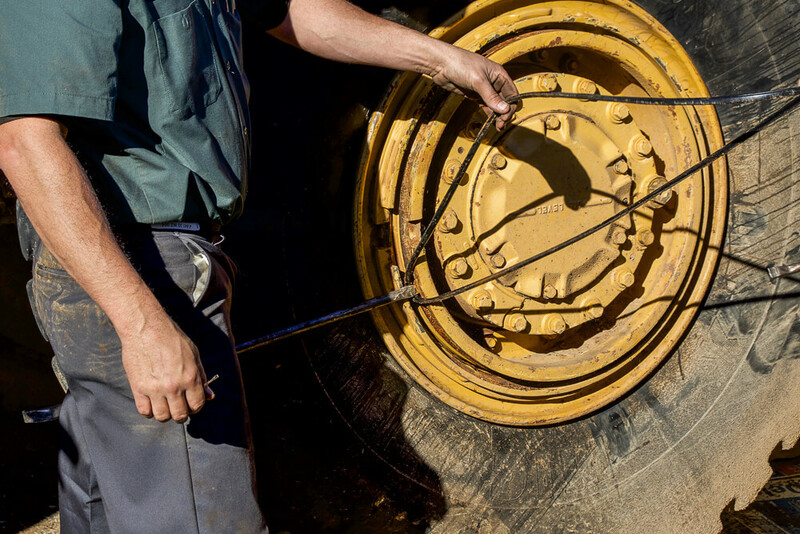 Take the time to find a good spot to temporarily store your outer rings in a safe distance away from where you are working but not too far away because you’ll be needing to use them after you get the new tire on the rim. Yes, now you will need to do all that work over again. Just this time, it will be even more difficult because you will need to crawl underneath the scraper and do it. Make sure that air jack is secure! Having a crane is for this job truly is a luxury. Please do the right thing and dispose of your old tires responsibly. Ahh the smell of fresh rubber, such a satisfying moment. Out with the old and in with the new! This step is actually a variable depending on the owner/operator specifications. 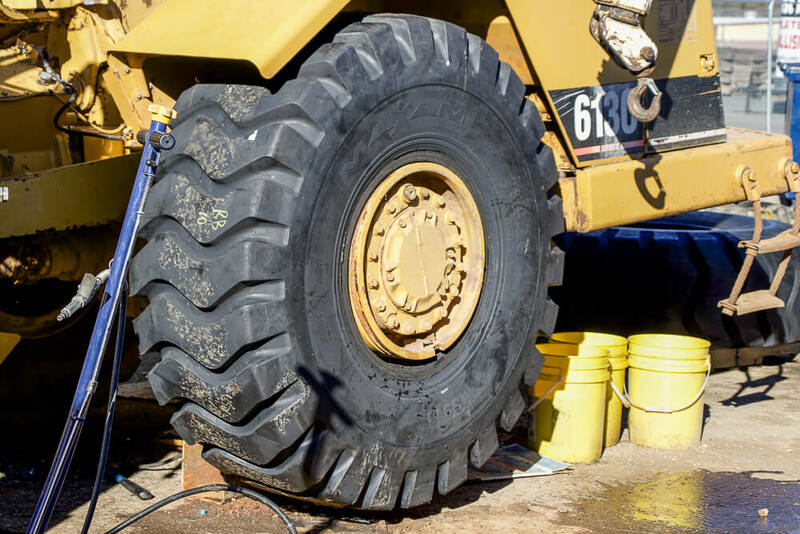 In some cases, having water in the tire is actually preferred when the unit is used on hillsides as it helps with stability. In this particular scenario, the water needed to be extracted. If the owner wants the water out of the tire, get it out by any means necessary. Even with all the power of the crane, nothing beats a little old-fashioned elbow grease. Looking good, almost there, but not quite. 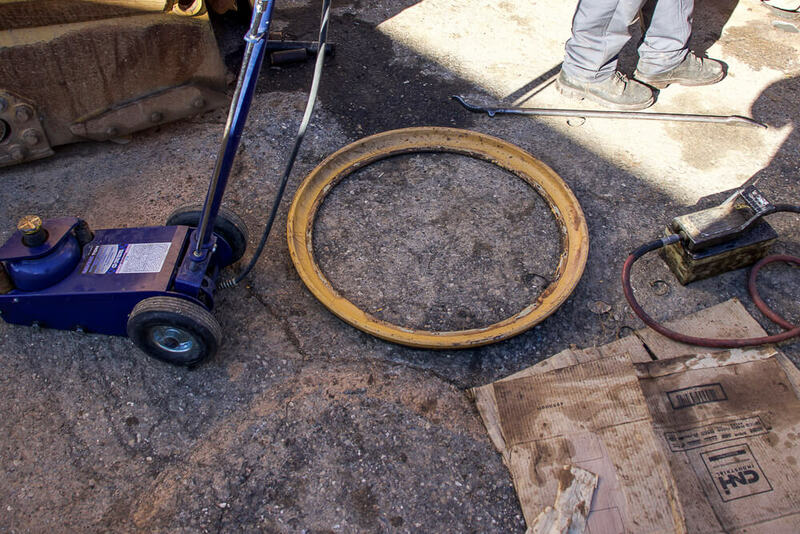 A grinder will come in handy to knock encrusted dirt and debris off of your old outer ring. Imagine if you bought a brand new pair of shoes, would you want to put them on if you’re wearing an old dirty pair of socks? I think not! 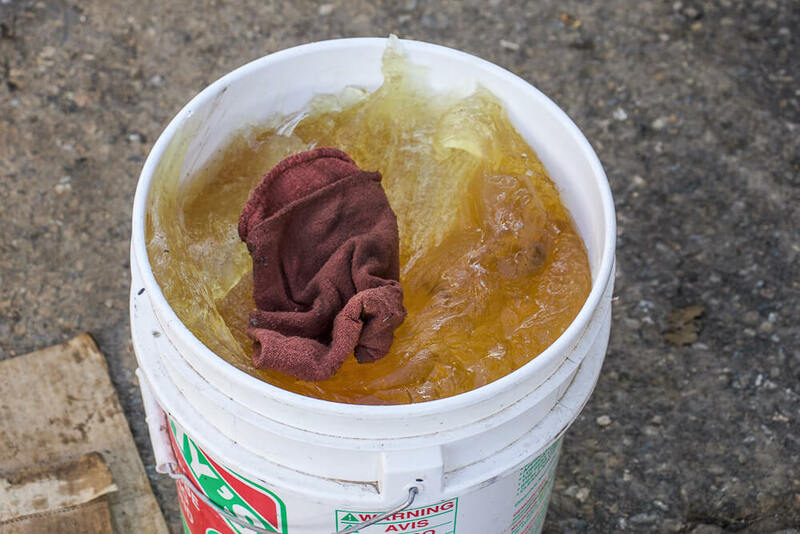 Remember how we diluted the raw soap with water to aid in the extraction of the old tire? Well, with the new tire we want that top shelf lube to ensure the insertion of the new tire onto the rim is smooth and gentle. Sometimes, you need to just get on your knees and get the job done. Keep it tight, keep it right! 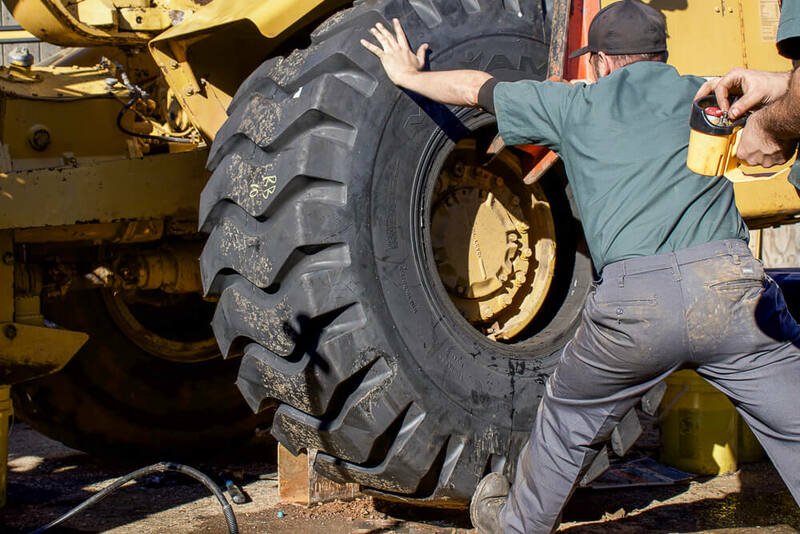 When it comes to industrial tires, Monster Tires has got you covered. 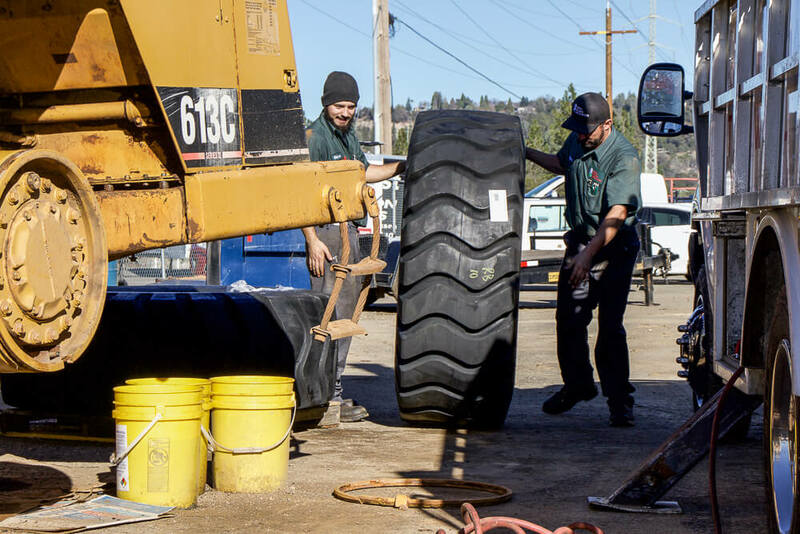 We aren’t looking to just sell you a set of tires but to provide you with a real resource you can rely on and develop a relationship with you to last a lifetime. You see, we aren’t just a gang of geeks that built a website to try to make a quick buck. We’re guys just like you, who have been out there on a job site. 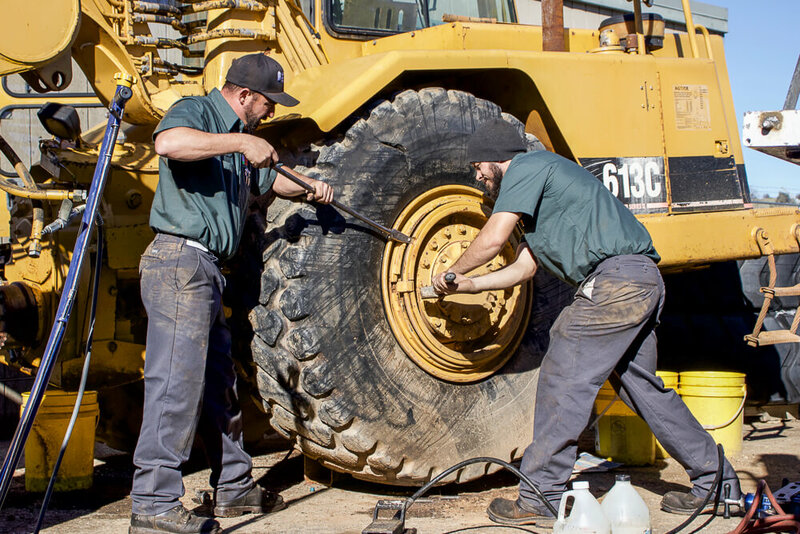 We’ve dealt with dirt and debris pelting us in the face on windy days, the stress of trying to operate your unit in tight spaces, the frustrations maneuvering around crowded job sites, and calculating logistics on rough terrain. We’ve been there and done it and that’s why when we make suggestions on the best tires to meet your needs, we do so with confidence! 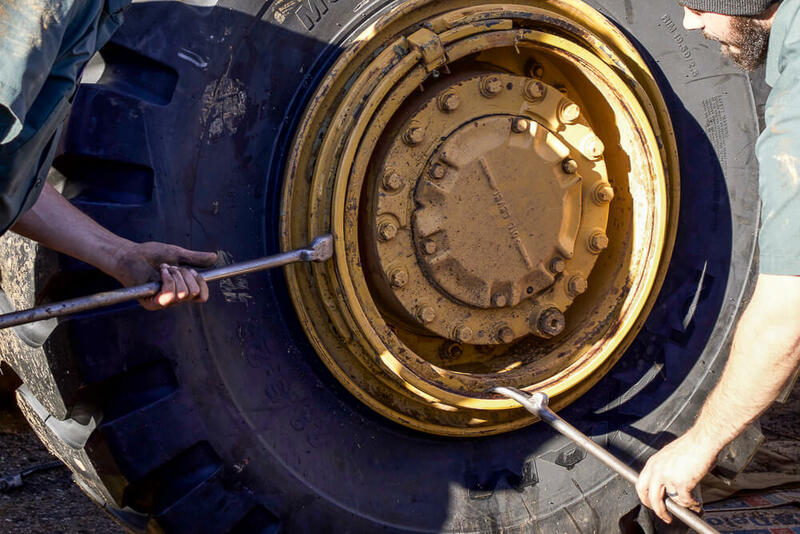 Tell us the application you will be working in and the type of terrain and we will ensure the tire tread pattern is just what u need to get adequate traction to get the jobs done safely and efficiently. Contact Monster Tires today and you will see why a vast majority of owners and operators rely on us as their go-to source for all their tire purchasing needs! 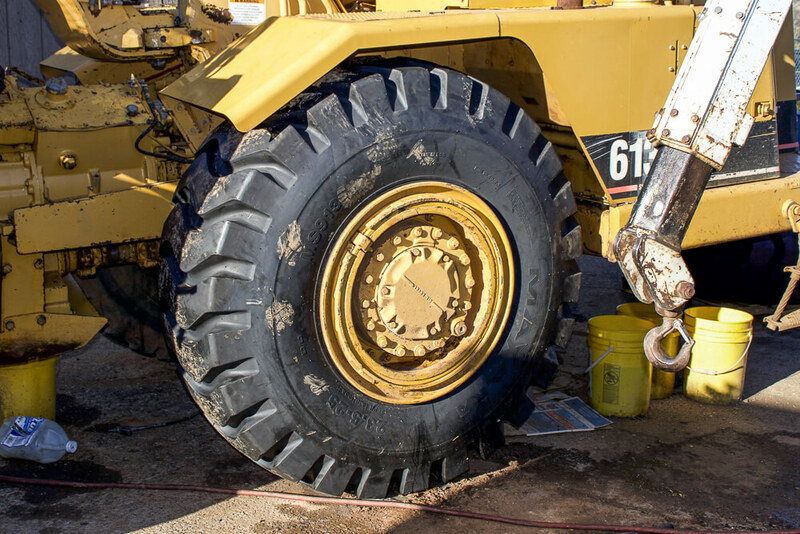 This entry was posted in Caterpillar, Industrial Tires, tire installation, Tire Safety. Bookmark the permalink.